Hot news from Rory Trahair at Edmiston & Company that Chris Cecil-Wright acted for the buyer in yesterday's sale of Feadship's 55.5m motor yacht Drizzle, with Jonathan Syrett at Camper & Nicholsons representing the seller. Drizzle was built to Lloyds class by Feadship’s De Vries yard in 2005. With a steel hull and aluminium superstructure, zero speed stabilisers, an economical transatlantic range, exquisite joinery and a striking interior, she's an outstanding Feadship superyacht in her size category. MCA compliant, the interior, by Redman Whiteley Dixon and London’s Todhunter Earle, accommodates 10 guests in a master suite, three double staterooms and a twin cabin. Twin 1520hp Caterpillar engines give Drizzle a range of 3,600 nautical miles at 12 knots. 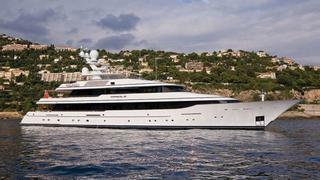 The asking price was €46.95 million and Drizzle is now renamed Issana.